After six years, Steve Hogarth's output with Marillion has reached this, their fourth album since the departure (and some would say demise) of Fish. The most immediate thing about Afraid of Sunlight is that it is not along the same lines as Brave, but rather a return to more of a Holidays in Eden style. While that isn't entirely true (the atmospherics and production are virtually the same as Brave), it is true in the most obvious department, the songwriting. The opener, "Gazpacho," is a snide commentary directed towards some of the most well known media figures (OJ Simpson, Princess Diana and Prince Charles, etc...). Ian Mosely's drumming is straighter than ever, as he experiments with some new sounds and moves away from the traditional drum kit approach throughout the whole album. "Cannibal Surf Babe" has been discussed ad nauseum, but is more or less a poke at the Beach Boys. Here, it pretty much falls flat on its face (but it does work surprisingly well in their live show). Next up is "Beautiful," a typical Hogarth sugar-coated ballad. The "Afraid of Sunrise / Out of This World / Afraid of Sunlight" suite fills the center of the album, and the soaring guitar solo in "Out of This World" marks the highlight of the album. Indeed, it is the ONLY real solo on the album, and that is a major disappointment. In fact, there are only a few lead lines on guitar or keyboard at all. The closer, "King," is perhaps the strongest single track, with its frenzied and dark ending hitting you like a slap in the face. Not what you'd expect from Marillion. Overall, this album sounds more like leftovers from Brave and Holidays in Eden than anything else. Certainly Brave remains the high water mark of the Hogey years, and this is an inadequate follow up. 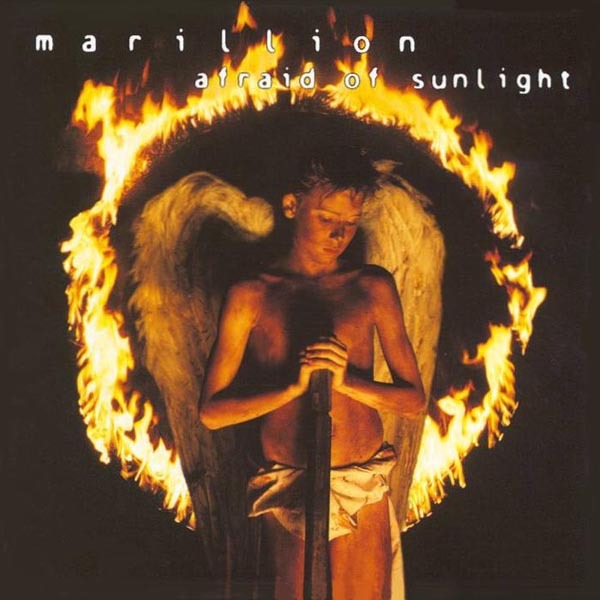 With all of the bad things I had heard about this album before even listening to it, I was wondering if Afraid of Marillion might be a more appropriate title. I ultimately overcame my fear of the album and gave it a listen. Unfortunately, I quickly realized I was probably going to agree with many of the prior criticisms I had heard. On Afraid of Sunlight, Marillion has certainly developed and refined their style since last year's Brave. However, the foundation for this album is based on many of the things I liked least about Brave. For example, most of the Afraid of Sunlight tunes have a slow and mellow feel to them. Even the upbeat numbers seem to drag. I felt similarly about Brave and hoped it was a trend that they would not continue. The songs all sound like they're building up to something, but don't ever get there. I keep listening, waiting for the pinnacle, but it never arrives. Marillion has the capacity to go all out with the best of them, and that is where they really excel – like in the chorus of "King of Sunset Town" for example. That pretty much rocks! While I admire bands that don't remain stagnant and change with each release, I don't like to see groups abandon some of their best traits either. The finale song on the album, "King," maybe autobiographical to some extent, sounds like it's about dealing with the pressures of success and how it can be difficult getting what you think you want. It has the closest thing to an all out jam on the entire album, and is probably the best track. "Afraid of Sunrise" is also one of the better tracks and features some really enjoyable fretless bass work – probably the highlight of the album for me. The "feature" track, "Cannibal Surf Babe," has an obvious nod to the Beach Boys, but sounds like a weird cross between "Good Vibrations" and the theme to Dr. Who. Maybe that was the intent, but I'm not really convinced that it works. As much as I wanted to like this album, I really have a hard time getting into it. Calling it boring would be harsh, but it is certainly dull at times. After Holidays in Eden, I thought Brave was a step in the right direction. I can't say the same about the transition between Brave and Afraid of Sunlight.